There are several methods for early diagnosis of pregnancy. The most accurate of them is the blood test for HCG. It can be done in a few days after conception. Is considered accurate enough and the method of determining the level of chorionic gonadotropin in the urine. 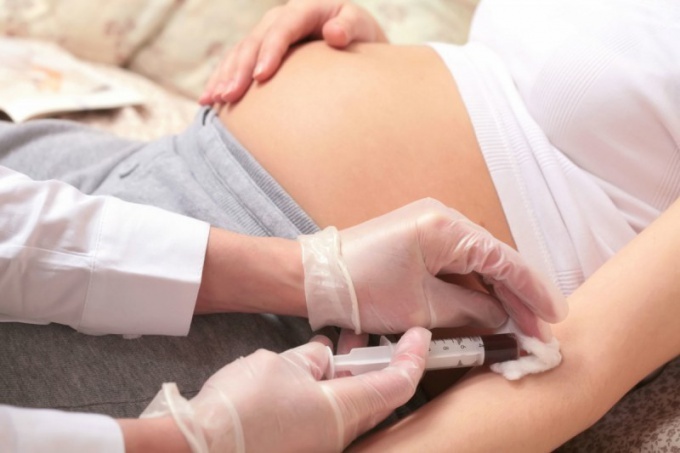 To diagnose pregnancy at an early stage, you can take a blood test for HCG. This method is considered to be one of the most accurate. Human chorionic gonadotropin - a hormone that begins to be produced in the woman's body immediately after the implantation of a fertilized egg in the uterine wall. Diagnosis of growth the level of HCG in biological fluids allows to speak about occurrence of pregnancy. In rare cases, the hormone levels can rise for other reasons. This is a sign of serious disorders in the body and requires immediate medical diagnosis and subsequent treatment. First and foremost, human chorionic gonadotropin, it is possible to determine in the blood. A few days after conception the concentration of hormone in this biological fluid starts to rise. Implantation of the embryo into the uterine wall occurs a few days after conception. Thus, a blood test for HCG can be carried out 5-7 days after intimacy. If pregnancy is achieved, the analysis will certainly show. To donate blood for HCG is possible in the antenatal clinic, family planning centre or in a special laboratory. The result of the analysis will be known very soon. It should be noted that this diagnosis is paid. Free analysis can do only by referral from the gynecologist. The level of human chorionic gonadotropin in urine after successful fertilization, increases at a much slower pace than in the blood. To pregnancy can be diagnosed by using test strips that are sold in every pharmacy, it is necessary to analyze not earlier than 2 weeks after the sexual contact. Given the fact that ovulation usually occurs in mid-cycle, diagnosis of pregnancy using a standard test you from the first day of menstruation. The test can be done earlier. In many cases, the pregnancy may already 7-10 days after conception. It should be remembered that in this case the probability of obtaining a false negative result is too large. If the test appeared only one band, you need to wait the beginning of menstruation and to make Express-analysis again. The level of HCG in biological fluids will increase daily. If a woman doubts in the negative result of the analysis, it can repeat it every 2-3 days. A blood test for HCG or human chorionic gonadotropin better known as the earliest a pregnancy test, however, the level of this hormone is significant in a number of cases, including tests for some types of cancer, dope, and chromosomal fetal anomalies. Human chorionic gonadotropin contributes to the maintenance of the corpus luteum – endocrine structures are involved in the production of progesterone, a hormone which plays a vital role during pregnancy. HCG is able of shedding the immune cells of the mother, protecting the fetus in the first trimester of pregnancy, to the complete formation of the placenta. The chorion produces HCG, its predecessor. The scientists also hypothesized that evidence which lately is more and more that HCG helps the mother to form immune tolerance to the fetus. It is believed that chorionic gonadotropin is responsible for the famous nausea in pregnancy, and at one time HCG was attributed to the "magical" ability to "program" the body to get rid of excessive body fat that can damage the unborn baby. On this supposed property was even developed by some HCG diet, but further research did not confirm this hypothesis. While pregnant HCG and is produced by the chorion, there are other forms of this hormone, for example, produced by the pituitary gland or, in the case of cancer, secreted by cancer cells. Tests for HCG are of two basic types: urine and blood. The urine is a very common analysis, working with large quantities. Urine analysis, for example, will not show a pregnancy until 12-14 days after conception and in the "diluted" urine test and in the later stages can be false negative. A urine test can give the result at a concentration of not less than 20 mIU/ml. Blood tests for HCG are qualitative and quantitative. Quantitative study of blood serum for human chorionic gonadotropin, also known as test for beta-HCG, capable of detecting even trace amounts of the hormone. The analysis is done, typically, every two days, and helps to not only confirm pregnancy but also to show normally if it's leaking. The qualitative study confirms the presence of hormone, and is almost as effective as a good urine test. A blood test for HCG take usually from a vein usually from the inside of the elbow or back-of-hand. The puncture site is cleaned with antiseptic, a hand pulls the harness in the shoulder area to make the veins to swell, and the health worker gently puts a needle into a vein. The sample is collected in a sealed vial, then removed the needle and tourniquet are removed, and the puncture site is applied a cotton swab with decontamination agent. Special training analysis is not required, but you must abstain from eating for 4-6 hours before the test. Many physicians recommend to donate blood for HCG in the morning and on an empty stomach. Risks blood test for HCG the same as all tests derived from the veins. You may feel varying degrees of discomfort from the puncture, you may be dizzy, sometimes till fainting formed a hematoma at the puncture site. Special risks for pregnant women analysis has not. In addition to diagnosing pregnancy, in early pregnancy, your doctor may prescribe an analysis on the HCG to make sure its normal course, with the threat of miscarriage or ectopic pregnancy. HCG included in the screening test, which is used for prenatal diagnosis of fetal malformations. This analysis is taken after the induced abortion, to assess its completeness. The analysis is prescribed not only women but also men, to diagnose certain types of tumors. Another case when you take the test HCG blood in athletes suspected of using certain types of doping. In men and non-pregnant women HCG is elevated in some types of cancer, including ovarian cancer in women and cancer of the testicles in a man, and when seminoma, teratoma, choriocarcinoma, tumors of germ cells and molar. Normal range of HCG for men and non-pregnant women is between 0-5 Miu /ml, postmenopausal women from 9.5 mIU/ml. After receiving the results of the analysis on hgch, in no case should not engage in self diagnosis. Accurate interpretation of the analysis can be done only by a qualified technician who is familiar with your medical history. Besides nobody is insured from laboratory error and , if a blood test for HCG you are alerted, do not immediately fall into despair. Chorionic gonadotropin begins to be produced in the woman's body immediately after fertilization. If the pregnancy is missing, the level of HCG should be almost zero. Human chorionic gonadotropin is a hormone which is formed in a woman's body during pregnancy. It performs a number of important functions and modern doctors believe that without a sufficient level of concentration of HCG in the blood of childbearing is simply impossible. The lack of growth during the first half of pregnancy may indicate the presence of pathologies. In particular, it may be a sign of the location of the ovum outside the uterus. Human chorionic gonadotropin is determined in the blood 10-12 days after the onset of fertilization. As a rule, at this period, its concentration is 100-200 honey\ml. Each week it increases in 2-3 times. There is a graph showing normal growth hormone concentrations in the blood throughout pregnancy. Not pregnant women and healthy men the level of HCG in blood is only 0-15 honey\ml. Concentration in the urine even lower. In most cases, to find in it human chorionic gonadotropin using the standard tests is simply impossible. In this case, you need a more in-depth study. There are cases when a woman is not pregnant, but HCG levels in her blood. Such analyses often can be observed after undergoing an abortion or if the woman is taking certain hormonal drugs. The doctor didn't jump to conclusions, she should tell him about what dosage hormone treatment she's taking at the moment. If elevated levels of HCG found in the blood of a man or woman, not to do the abortion and who do not use hormonal drugs, this may indicate a number of serious violations. Most often, these test results indicate the presence in the body of tumors. It is believed that the body responds to the changes taking place in it. A slight increase in the level of chorionic gonadotrophin occurs in women during menopause. However, this increase rarely exceeds the upper limit of the accepted norm. The negative results of the blood test for HCG you can try to retake it, to eliminate the possibility of error. Blood for HCG you need to pass in the morning on an empty stomach. If your doctor has prescribed tests for the afternoon, before that it is advisable not to eat for 4 hours. Chorionic gonadotropin begins to be produced in the woman's body immediately after the implantation of a fertilized egg in the uterine wall. During the first half of pregnancy the concentration of this hormone in the blood is constantly increasing. Human chorionic gonadotropin is a hormone that begins to produce in a woman's body during pregnancy. Before the concentration of HCG in the blood is only 0-15 honey\ml. Immediately after the implantation of a fertilized egg content of the hormone in biological fluids begins to grow rapidly. Levels of human chorionic gonadotropin in the blood and urine are totally different. Increase in blood concentration can be detected much faster than in urine. If a woman is very important to diagnose pregnancy in the early stages, it can pass blood test. Diagnosis is possible in only a few days after fertilization. Standard pregnancy tests in the form of strips, which must be dipped in urine, can be used only from the first day of menstruation, but not earlier. If you do analysis before, the probability of obtaining a false negative result. There is a timetable for increasing the level of HCG in the blood within normal limits. It is believed that each week the concentration of gonadotropin should increase by approximately 2-3 times compared to its previous value. But this is only an approximate growth rate. 10-12 days of pregnancy the level of HCG in blood is 100-150 honey\ml. in a week this will increase to 200-400 honey\ml At 4-5 weeks of pregnancy, the concentration of the hormone in the blood should be 2560 — 82300 honey\ml. The level of HCG grows rapidly during the first trimester of pregnancy. Around 12 weeks the growth rate slowed down, and at 16 weeks the concentration of the hormone remains unchanged or begins to decline. If the growth rate of the concentration of HCG in biological fluids do not conform to the norm, this may indicate the presence of certain pathologies. For example, the slow growth of the levels of hormone in the blood can be a sign of ectopic pregnancy, as well as the existing threat of miscarriage. The decrease in the concentration of HCG in biological fluids during the first trimester of pregnancy may indicate fetal death. Blood to determine the level of HCG can be taken in the antenatal clinic. In most clinics it is paid. Women who already have the sad experience of miscarriage, should be regularly to donate blood to determine the concentration of HCG. This will help to identify certain types of abnormalities in the earliest stages of their development. Human chorionic gonadotropin is a hormone that begins to be produced in the woman's body immediately after a fertilized egg embeds itself in the uterine lining, and pregnancy can be considered valid. At first, the amount of this hormone so small that to prove its existence only by means of a special blood test, but every day its concentration is increasing. pregnancy. The concentration of HCG in the blood rise very quickly, it increases every 2 days at least twice and after 1-2 weeks after fertilization, i.e. 3-4 weeks after the start of the last monthly bleeding, reaches the value of 25 mIU\ml and more. Between 8 and 12 weeks the concentration of hormone in the blood reaches its maximum and can go up to 289000 mIU\ml, and then decreases gradually and remains low until birth, after which HCG again disappear from the blood almost completely. The rise of HCG in a woman's urine occurs in a similar scheme with the only difference that its concentration is always lower than blood, so the usual tests from the pharmacy to establish the fact of pregnancy is somewhat later, for about a week, that is just by the time delay of the menstrual cycle. From this table it can be seen why steel possible things, when the woman has a nice belly as a joke or seriously checks my urine pregnancy test and gets a negative result. The test does not look at the stomach, it determines the concentration, and by the end of pregnancy, it can decline so much that it is not enough to trigger the test reagent. You can also see that the scatter of the values in the table are quite high, therefore, based on the analysis, to determine the exact duration of pregnancy is quite problematic. That is 10000 mIU\ml can be defined as the end of the 5th week and beginning of 8-9. This means that to determine the period it is better to use some other method, such as ultrasound. During pregnancy a woman's body continuously produces the hormone human chorionic gonadotropin or HCG. This is responsible for the alteration of an organism of the expectant mother, so his level to judge the duration of pregnancy. The converse is true: depending on the period of pregnancy the level of HCG in the body varies considerably. After conception, the cells that form the placenta begin to produce the HCG hormone. For the first time to lock it in the blood of pregnant women by 11 days after conception, in urine on day 14. It is his discovery is based the principle of popular home tests for pregnancy. It is believed that pregnancy is diagnosed if the level of HCG more than 25 mIU/ml. If its normal for the amount of the hormone increases like an avalanche: the level of beta-HCG doubles every 2-3 days. In multiple pregnancies the amount of the hormone is proportional to the number of kids increase at a faster pace. - 3640-117000 mIU/ml: a period of 25-40 weeks. It should be remembered that the numbers can vary: it is important not only in itself a numeric value, but the trend of its changes. As you can see, 6-7 weeks after conception levels of HCG stabiliziruemost, and after 12 weeks slowly decreasing. It is on this depending on the amount of the hormone of pregnancy is based the principle of operation is very popular with moms-to-be calculator of HCG. How to use the calculator HCG? First of all, it is very convenient to interpret the results of laboratory blood tests the amount of HCG in the body, and also to analyze the growth level of HCG. For calculation of growth hormone in program-calculator entered information about the level of hormones in the first test and the number of days after ovulation, the hormone levels in the second test and the number of hours between the 2 tests done. - over 6,000 Miu/ml over 96 hours or more. - lack of growth HCG sometimes indicates a dysfunctional development of pregnancy, in particular the threat of miscarriage, as well as the fading of the fetus.